I love baking, I really do.... but sometimes life just gets in the way. There's weeks where I bake up a storm and others where don't bake a single thing as I'm too busy running around here there and everywhere and busy with work. 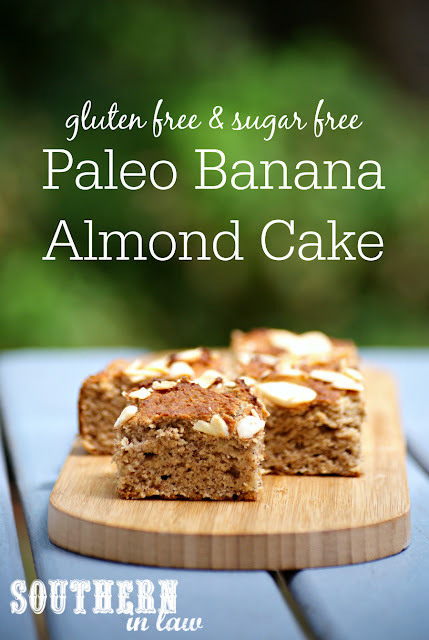 Generally those bananas are used to make another loaf of my The Best Healthy Paleo Banana Bread Recipe - but if there's extra bananas left after that, I like to experiment with new recipes. This delicious banana cake recipe was born when I had a overload of brown bananas and wanted to come up with something a little bit different. It's paleo, it's dairy free, it's grain free and it's seriously easy to make. Fluffy and light, you'll never believe that they're made with only six ingredients - seven if you top them with extra almonds. Optional: Mix ins of your choice (choc chips, nuts etc) or flaked/sliced almonds to top your cake as shown. Line an 8" baking tin with baking paper and set aside. In a medium mixing bowl, mash your bananas and mix with your eggs, maple syrup and almond butter. Mix in your coconut flour and baking powder, mixing until all ingredients are combined and your batter is smooth. If using, stir through your mix ins. Pour your cake batter into your prepared tin, smoothing the batter out with a spoon or spatula to ensure it's evenly spread. 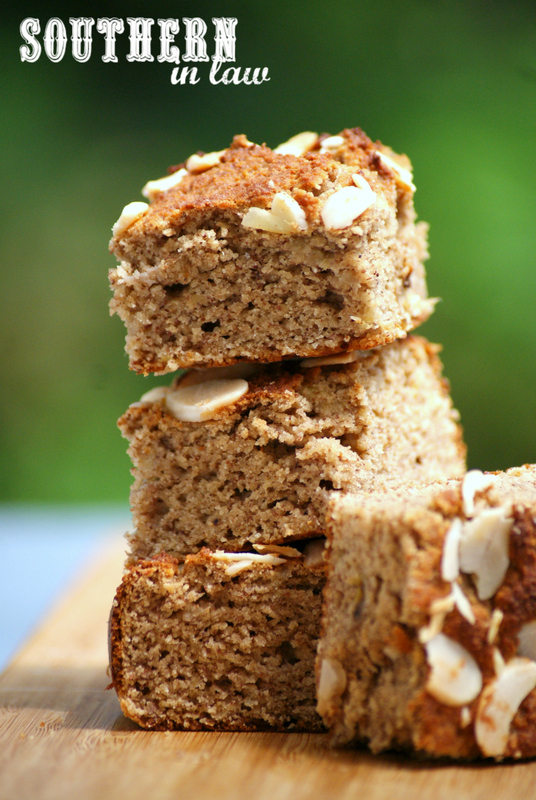 Sprinkle your cake batter with almonds (if using) and lightly pressing them into the top of the cake. Bake for 25-35 minutes or until your cake is golden and cooked through. You'll know it's cooked when a skewer inserted into the middle of your cake removes clean. 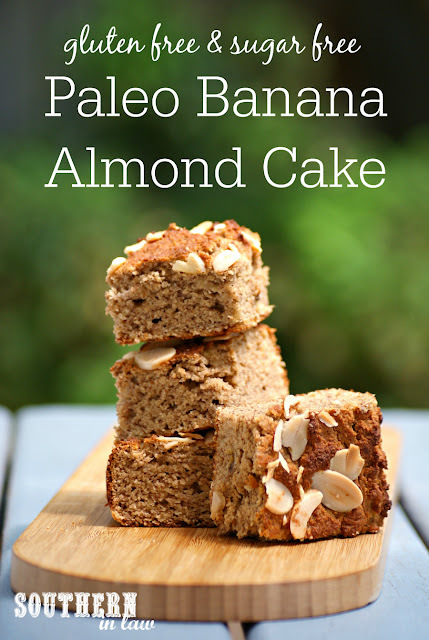 This cake will keep in an airtight container at room temp or in the fridge for 2-3 days or individual slices can be frozen and defrosted to enjoy whenever you like. *You can switch the maple syrup for honey or rice bran syrup/brown rice syrup or sugar if you prefer. If you like your cakes really sweet, you may want to increase this to 1/3 cup. **Instead of almond butter, you can use your favourite nut or seed butter. 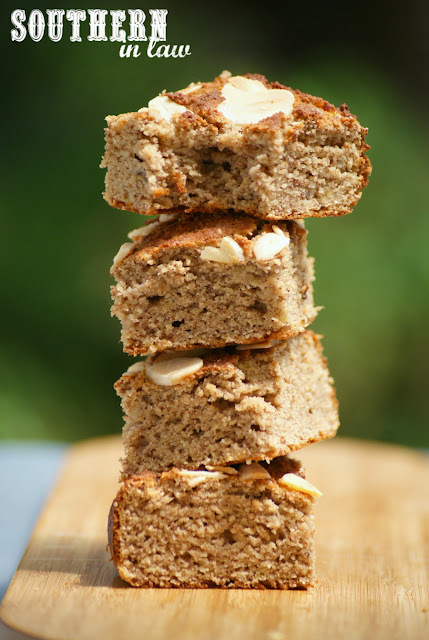 We have tried a nut free version with sunflower seed butter (we used this organic unsweetened SunButter), a non-paleo version with peanut butter and several batches with cashew butter and other nut butter blends. But tell me, what do you usually make with spotty bananas? And what's the last thing you baked?